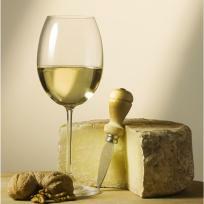 The Umbrian white wine represents, among all the Italian white wines, a production core of very high quality. The DOC, denomination of controlled origin, and the even more protective DOCG are the guarantee of quality of the Umbrian white wine and of the best part of the Italian white wines of the region; however, some varieties of grapes deserve a particular mention as they best define the wine and gastronomic character of the region. The most diffused white wines belong to the local types of the Trebbiano white wine, like the Procanico, that has been the basic grape of the Orvieto white wines, but are also cultivated the Trebbiano Toscano and imported varieties like the white wines Garganega and Tocai. Some indigenous varieties are also resisting and even increasing their own production year after year like the Trebbiano Spoletino wine, the Verdello wine and above all the Grechetto wine. The various microclimates of the region allow the cultivation of more grapes also at short distances, so that the white wines are produced with combinations of grapes that increase their taste shades. It is also the case of the Italian white wine of the Hills of the Trasimeno, where the lake exercises its influence on the vineyards and allows to obtain white wins vivacious, and at the same time elegant and refined, or wines of the area of Torgiano where white wines fragrant and full come from the hills with the warm climate, at the south-east of Perugia, wealthy of clayey, sandy and calcareous lands, laying on tuff substratum. The Altotiberini hills above the Tevere river at the northern limit of the region almost up to Perugia, are taking profit of the Trebbiano Toscano grapes and of the Malvasia of the Chianti and produce some excellent light wines. The Amerini Hills, at the east of the Tevere river and along the valley of the Nera river, and the Martani hills, on the high plains between Todi and Foligno are generating doc wines among which the most famous are the Trebbiano, the Grechetto, and the Grechetto of Todi. At last, the Orvietano, is the area of the famous vineyards of Orvieto.